The emergence of a holistic approach to monument documentation is inextricably associated with the term ‘monument’, the quest of its meaning and its interpretation to the people involved in the documenta-tion of the past. The main reason is the necessity to set tangible heritage in its wider context, and relate it with its physical environment and its intangible aspects (spiritual, political and social values) [1–3]. In this way, a monument can be seen as a whole, within a place with a soul – a genius loci . This example focuses on the holistic approach taken to documentation activities St. Neophytos; a church with tremendous monumental interest both for its tangible and intangible aspects as well as the unique blending of natural and man-made environment. The Digital Documentation of Monuments has made great progress in recent years, in parallel with ICT. However, the pace of this development has left gaps in digital documentation and created challenges for data quality, accuracy, standards, archiving, copyrights and sustainability. There is a need to establish a widely followed workflow which optimizes collaboration, distribution and capitalizes on the value of the monument. the most troubled and intense moments in this part of the Mediterranean: crusaders (English, Normans), byzantine and Arab elements are clearly reflected in the Enkleistra. The paintings (frescos) are characteristic of the “Komnenian” Byzantine art period (mid-12 century), identified by strong emotions, mainly of passion and suffering and sophisticated proportions and movements of the figures who are dressed in rich clothes with wavy edges. There are few frescos saved in such good conservation state. The preservation of the Enkleistra and the extensive documentation of its origin, development and further interventions provide clear information for its interpretation and confirm the authenticity of each element. This existing written documentation, the structure, organization and paintings of the Enkleistra are key to understanding the ways of the monastic life in the twelfth century. The organic form of the Enkleistra and the plasticity of the cave carved in the rock differentiates it from any other religious building around the island. It is situated in a unique landscape, excavated in a cliff overlooking a valley and has withstood landslides and earthquakes for more than 800 years. It has been continuously used for monastic life and as a pilgrimage destination for centuries. These factors add to its historic and cultural value and attract people from all the corners of the globe until this day. Function, symbolism, use and the natural shape of the mountain are interconnected in this monument, unified and understood into a unique example of Cypriot religious architecture. The Enkleistra is situated in the southwest part of the island of Cyprus, north of Paphos, 6 km away from the sea, at an altitude of 450 m. above sea level. The monastery complex is located in a natural valley oriented south. The mountain cliffs are of a white calcareous rock, a workable material which is easy to be eroded by natural phenomena (rain, vegetation, landslides) and/or hewed by man, thus facilitating the creation (natural or artificial) of caves. The life of Saint Neophytos Enkleistros (“The Recluse”) (1134 A.D. – 1219 A.D runs parallel with one of the most unstable political periods in Cyprus. At the age of 17 years old he chose the monastic life and for five years remained at the St. Chrysostom monastery near Kyrenia, cultivating the land and learning how to read and write. After two years he set off for Jerusalem and shortly afterwards attempted to go to Asia Minor in search of solitary life and enlightenment. His attempt was unsuccessful and therefore decided to become an ascetic at the hilly area above Paphos. In 1159 A.D. he departed for his place of reclusion and formed his cell by modifying an already existing one, encurved on the body of the mountain. 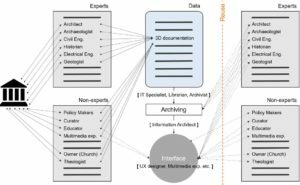 The proposed methodology of holistic approach presents a workflow that could (at the full end level) answer the requirements of the monuments’ digital documentation by involving all user needs from the beginning of the process. The first step is the analysis of cultural heritage users and stakeholders. They can be categorized in two major teams: experts and non-experts ; “experts” are users that create digital data from documenting monuments and “non-experts” are users that only use these data. Nevertheless, due to the fast development of the creative sector -especially in EU- the “non-experts” are creating new content that we cannot afford to leave outside the monuments’ digital documentation, especially in the holistic approach. Hence, the boundaries of these teams are loose, expanding them is our aim. The second step is a parallel analysis of the cultural heritage information that we need to extract from the monuments’ digital documentation. the proposed holistic methodology requires much of the documentation to be digital and not digitized. However, obviously analogue data cannot be avoided, especially during historic research, so digitization will be applied following the same scheme of metadata. Lastly, the 3D documentation of the monument is essential for a holistic approach; documenting and creating the 3D model is a procedure that involves a number of users (experts and non-experts) that can directly benefit from the information cov-ered by the 3D, many of them could offer data to upgrade the quality and enrich the information of the 3D model. In the case study of Saint Neophytos, the proposed methodology workflow was followed. The 3D Model was the crucial part of the workflow. An example of the high value of the 3D digital model in this case study the demand for documented information to be useful for a number of areas of analysis: structural, pathology and conservation state, hazard, humanities, intervention and monuments value – each of which is relevant to different user groups. The outcome of the digital documentation of the Enkleistra of Saint Neophytos is a highly-detailed 3D model, which may act as a reference point for the creation of applications. However, the proper function of these applications relies on the existence of a corresponding database on a server and/or in cloud systems, where the acquired data needs to be stored in a format that will be accessible and easily interpreted by all. For proper interpretation, it is essential to establish standards for the collected data, leading to improved integrity and decreased storage of redundant data. Stored data should follow Open Access principles in order to ensure its wider access and reuse. In parallel, a user-friendly interface should be developed to help non-expert users to find the required information. Fig. 3 Different Users’ involvement in holistic digital documentation of the monument of Saint Neophytos. During the years 1963-1965 interventions of consolidation of the structure were carried out with the super-vision of the Department of Antiquities of Cyprus. A covered veranda and five arches resembling the originals cited by the Saint were constructed (Level 1). Also, stairs and paths from the Hagiasterion (Level 3) to the upper level (Level 4) were constructed. The geometric documentation of the Enkleistra involved, a combination of field surveying, terrestrial laser scanning, photogrammetric and computer vision techniques. First, a geodetic network was established con-necting the area in front of the rock, which includes the Enkleistra and the interior of all the rooms that exist inside the rock; so, all measurements and data collected can have a common georeference. Scanning by a terrestrial time-of-flight laser scanner and image taking through terrestrial photography and the use of a small quadcopter UAV have been made at the external and surrounding area of the monument. The combined use of images, for the application of image-based 3D modelling techniques, and laser scanning was necessary for the complete coverage of the complex areas inside these rooms. In the rooms of the upper part of the Enkleistra the acquisition of photos (a few dozens for each room) was sufficient for the creation of 3D models. More than 200 ground control points (GCPs), including both artificial targets and natural features easily recogniza-ble in the imagery, were measured; also, the retroreflective targets of the laser scanner were measured to co-register the image-based and laser-based point clouds. An important stage is the detailed documentation through the 3D recording of the monument; the products of this stage are also used as the basemap for the studies of other specialists. First, the complete 3D geometric documentation of the Enkleistra via photogrammetric and surveying techniques is a fundamental step for ad-dressing its structural and environmental problems. The results of the geometric documentation (sections, ortho-images, 3D models) are then provided to for its preservation and protection, as well as the planning of conservative repair operations. Furthermore, the generation of 3D printings or photorealistic 3D tours depict-ing in detail the internal and external parts of the Enkleistra is another objective of the 3D recording procedure and promotion of the monument. The main product of the geometric documentation of the Enkleistra monu-ment is a detailed and accurate 3D model which includes both the external areas (the rock and the newer constructions, like the corridor, etc.) and the internals of the rooms (of the upper and the lower part of the Enkleistra) georeferenced in a unique coordinate system, so that their relative horizontal and vertical position will be correct. Having in mind the 3D models that are produced by means of survey as well as derived data, the data set created is stored in an SQL relational database taking advantage of its capability in supporting a plethora of data types (e.g. integer, chars, floats, strings), information to users regarding Enkleistra’s history and state through 3D models. Assuming the existence of huge amount of data that will be generated over time, the use of data mining techniques to the applications will be crucial for their analysis in order to improve their func-tionality. Towards that end, the collection of sufficient training data is most needed as Artificial Intelligence (AI) has reached a point, where advanced machine learning methods can be implemented in data mining tech-niques enriching their functionality. A Holistic Documentation Approach to Cultural Heritage requires an extensive and interdisciplinary research and a pioneering approach that considers its tangible and intangible aspects, complimented with a strong reflection in a wide variety of subjects. The outcome should act as a reference point for the application of restoration techniques that should be applied on Enkleistra’s physical infrastructure in order to limit the risks that threaten its integrity. Nowadays it is difficult to finance these methods due to the economic crisis that exists in the Mediterranean countries, however an important measure that should be taken into consideration is the listing of Enkleistra on UNESCO’s World Heritage Catalogue as a cultural heritage site of outstanding universal value from historical point of view by meeting certain criteria that should apply on its tangible form, leading this way in the raise of both domestic and global awareness towards its protection and conservation. 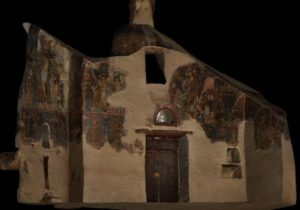 An online educational tool provides a new way of reusing Cultural Heritage data obtained from imagebased and 3D modelling, terrestrial laser scanning techniques, photogrammetry methods etc. which could also be applied in St. Neophytos case, including interactive lessons and activities using 3D representations of the cavern. 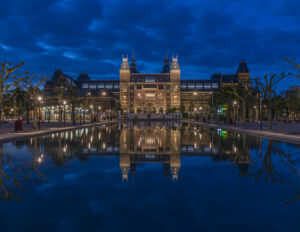 The expected benefits from an increase in cultural tourism also stimulate issues regarding its preservation, where tourists want to interact with the already damaged hagiographies, thereby creating further degeneration of their surface. Fortunately, the use of Virtual, Augmented and Mixed Reality technologies have reached a point of evolution where they can offer realistic and interactive experiences to humans, in order to contain touristic engagement inside the cave. Visitors could be “transferred” into a virtual representation of the cave where the Saint spent all his life and could interact with the digital frescoes in a way that is both engaging and educational through their participation in game(s) in order for St. Neophytos to “come alive” and recite his story. Lastly, creation of software and storage of the extracted cultural data along with its semantic interrelations, can be used in collaboration with modern advanced information systems like HBIM in depicting the optimal methods that can be exploited towards Enkleistra’s preservation. 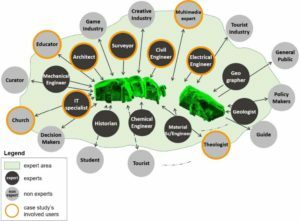 This kind of management system can act as a reference point for the holistic digital documentation of this monumental cave, providing reverse engineering data to professionals in multidisciplinary areas that work together in the protection and preservation using detailed 3D models. 2. Bouchenaki, M.: A major advance towards a holistic approach to heritage conservation: the 2003 Intangible Heritage Convention. Int. J. Intang. Herit. 2, 106–109 (2007). 3. Rodwell, D.: Sustainability and the holistic approach to the conservation of historic cities. J. Archit. Conserv. 9, 58–73 (2003). 4. Bold, J., Chatenet, M., Cortembos, T., Kovacec Naglic, K.: Guidance on inventory and documentation of the cultural heritage. , Strasbourg (2009). 5. Mango, C., Hawkins, E.J.W. : The Hermitage of St. Neophytos and Its Wall Paintings. Dumbart. Oaks Pap. 20, 119 (1966). 6. Tsiknopoullos, I.P. : The Encleistra and Saint Neophytos. Nicosia. (1965). 7. Snavely, N., Seitz, S.M., Szeliski, R.: Photo tourism: Exploring Photo Collections in 3D. ACM Trans. Graph. 25, 835–846 (2006). 8. Remondino, F.: From point cloud to surface: the modeling and visualization problem. Int. Arch. Photogramm. Remote Sens. Spat. Inf. Sci. XXXIV, 24–28 (2003). 9. Kakoulli, I., Fischer, C.: The Techniques and Materials of the Wall Paintings at the Enkleistra of St. Neophytos (Phase II). (2012). 10. Ioannides, M. et al Education use of 3D models and photogrammetry content; the Europeana Space project for Cypriot UNESCO Monuments. In: Proceedings of Fourth International Conference on Remote Sensing and Geoinformation of Environmentʼ, Cyprus, April (2016).23.